Alice Quentin is a psychologist, caring for some very vulnerable people, but someone who has a lot of personal issues and phobias of her own to deal with. A very independent woman, difficult to know or to care for, she ends relationships before they can fall apart and disappoint her. Her brother, Will, is a drug addict who lives in his van, often parking it outside Alice's flat. Their relationship is difficult. Alice's father beat her and her mother and forced Will to watch, but Alice cares for him, is desperate to help him but he resists her efforts. Alice is asked to giver her professional opinion on a convicted murderer, Cley, due to be released from prison on licence. DCI Burns wants to know what danger Cley will present to others on his release. Cley, a lonely man with learning difficulties was convicted of murdering a prostitute who he had asked to be his girlfriend. However, Cley was also friends with Ray and Marie Benson, a notorious pair of killers of 13 girls, who stayed at or were associated with a hostel for homeless people that they managed. Ray Benson died in prison and Marie, still protesting her innocence, has been sentenced to life but Cley's link with the Bensons worries DCI Burns. When Alice is running one morning, she stumbles across the body of a young woman at "Crossbones Yard", the burial ground for 1,000 prostitutes in Victorian London. The murder is suspiciously similar to those carried out by the Bensons and Burns immediately suspects that Cley may be copying the Bensons' methods and asks Alice to consult on the case. As Alice is reluctantly drawn into the investigation, she finds evidence that Will may have known the Bensons and worries about his possible involvement both in the previous murders and in the new copycat cases. Her life is further complicated by her ex-lover Sean, who wants her to explain why she is so cold to him; her growing feelings for DS Alvarez, and her concerns for Lola, her best friend who has a chaotic lifestyle and has moved into her spare room. Then Alice starts to get letters threatening letters, and a second body is discovered outside her home, by Will's van. This first novel is by a well-established poet. Her descriptions of a young woman trying very hard to hold her life in place while chaos is increasing around her is very readable. Alice is a believable character, although I was worried to read about a psychologist with such power over people's lives, who has so many personal problems, but this is fiction, I hope. The writing sometimes has that feel of travelling too fast, the words spilling from the page into the mind of the reader and this gives it almost a breathless quality in parts. A good read, very visual and I could imagine it as a film. 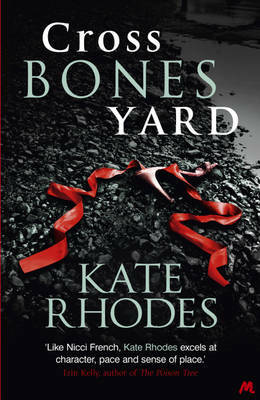 Read another review of CROSSBONES YARD.